You may or may not have seen the other Welding courses aside from this one but still, we are to offer you another welding course that might go with your preferences as a welder. This course is pretty much designed to improve the knowledge, desirable attitudes regarding extraordinary jobs, and skills in performing shielded arc welding work to a standard which are expected in the workplace. This short course will help you in specific works particularly in welding carbon steel plate and pipe components which is specified by layout, blueprints, diagrams, work order, welding procedure and oral instructions using of course, the shielded metal arc welding equipment. This course covers variety of competencies such as: applying safety practices, interpreting drawings and sketches, performing industry calculations, contributing to quality system, using hand tools, preparing weld materials, setting up welding equipment, fitting up weld materials, repairing welds, welding carbon steel plates and pipes using SMAW. These competencies can only be acquired of course, if you enroll in this short course. Otherwise, you may learn it from practical application but there aren’t any other institutions that would let you experience those in just a whim of interest aside from TESDA so it still is better if you enroll. 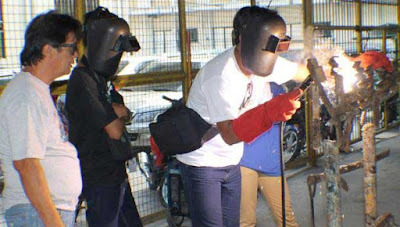 Shielded Metal Arc Welding (SMAW) course can be finished in a minimum span of 268 hours of sessions. Another note to first time takers: Some TESDA-Accredited institutions may oblige you to undergo and finish Shielded Metal Arc Welding (SMAW) NC I first before being permitted to take Shielded Metal Arc Welding (SMAW) NC II. Eligible graduates of Shielded Metal Arc Welding NC II may find employments as SMAW welders in both local and international. There are numerous jobs abroad that need skilled workers especially in New Zealand and middle east.